Oh noes! Not another cat holiday. Actually we have four reasons to celebrate today besides National Cat Day. Read on. October 29 is National Cat Day which launched in 2005, in the early days of cat holidays. It’s mostly known in the U.S. and now sponsored by a multi-national pet brand. 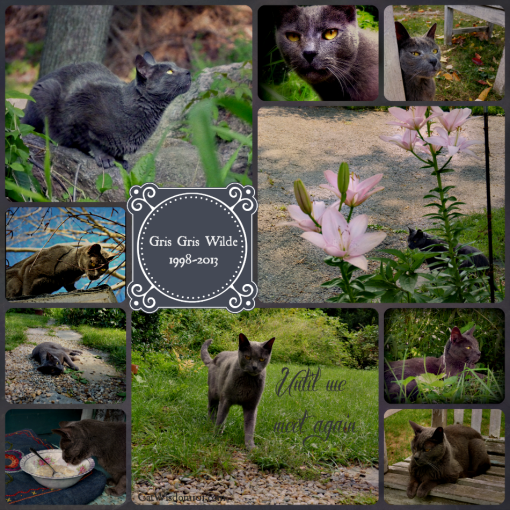 The first year we blogged about National Cat Day was in 2011 when happened to be the Gotcha Day of our Odin and his brother from another mother, Gris Gris. Check out the link above of Odin from his cute kittenhood days. Dear Gris Gris was already an old boy of 12. He’d lived in a basement without much human contact for most of his life. With his one tooth and anti-social ways, no one wanted to adopt him. He hated being picked up but would never nip or scratch. Never a lap cat, he bonded instantly with Merlin who was 16 at the time. Gris Gris enjoyed his second lease on full throttle for three happy years before dying of a stroke. He may not have been a snuggle bunny but he slept at my feet and never gave one moment of trouble. He never fussed over food, never had a litter box issue and got along with everyone. Famous for racing in circles and jumping for joy in the garden for no reason made my heart full. I think he was simply grateful to be alive and free from the dungeon. Unlike Odin, he cared little for hunting. The little gray rocket possessed the wiry body and intelligence of Whippet. He acted as a “seeing eye cat” for Merlin, the patriarch of our cat family who was losing his sight but still insisted on his daily garden walkabouts. He brought us so much joy, it instilled my love of adopting senior cats. It’s with much fondness to note his Gotcha Day in loving memory. Odin is still very much with us, older and perhaps wiser. All he cares about is hunting. He’s snuggly when it suits him. This was taken shortly after his Gotcha Day. Odin spies with his one eye, Gris Gris and a moving lump. 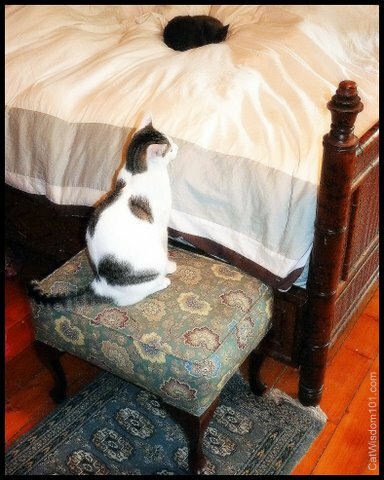 It’s Merlin, who loved sleeping under the covers but in Odin’s mind it’s prey. 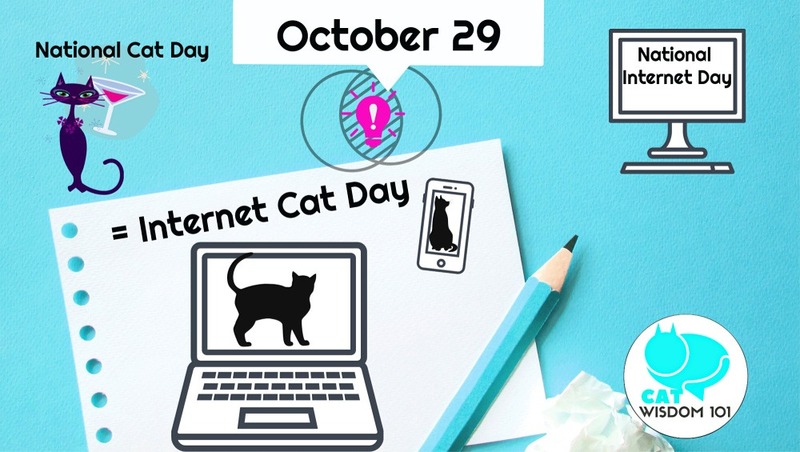 October 29 is also National Internet Day. Whether you call it the world wide web, the net, information highway or cyberspace, our world changed on this day in 1969. The first web message was sent on this date almost 50 years ago. That’s kind of mind-blowing. For those of us alive then, we might have taken some photos of our cats or a maybe a Super 8 video (anyone remember those?) but cats everywhere on the Internet, YouTube videos, and Instagram was beyond anyone’s wildest imagination. It makes purrfect sense to mash-up the two holidays and create a new one I’m calling Internet Cat Day. Why not? We already have a dozen silly or serious holiday every single day of the year. The longer I blog about cats, the more I realize everything has already been done. And long before the Internet. In 1879, a book titled Letters From My Cat was published. It presaged the anthropomorphism of cat culture today. Every possible variation of cats writing letters to or from humans has been done. I couldn’t resist taking three illustration to illustrate my point of how most art is derivative. We just keep reinventing the wheel. It’s harder to be truly original but we know instantly when we see something fresh. Meanwhile, my cats were acting fresh and not in a good way. They balked at the idea of a photo shoot for any holiday or a promised book review, It forced me to think out of the box. Gwen Cooper sent me an autographed copy of her latest book. My Life In A Cat House. It’s a memoir compilation including some of the short stories she published serially this past year. I’d read most of them and while eager to escape into Gwen’s cat world one thing led to another. Let’s just say it was not a good week for reading. Thank you to all the good wishes about my mom. Clyde’s sleek black fur looked great against the green cover but he refused. Maybe because the cute ginger cover cat wasn’t black. No, it had nothing with the book. He adores Gwen but wasn’t in the mood. When you’re almost 19, he gets what he wants. The plan was to try again the next day. No problem. I began to organize various anthills of books, magazines, old photos and folders on every surface, and to crop this tale short, I misplaced it. I like to think I’m organized in a chaotic mad scientist way but I’m really just messy. While sorting the lovely creative mess, I found oodles of inspiration for a dozen blog posts not to mention an idea for a memoir My Life in A Mad House but I digress. Too bad that title is taken. Not only did I not find the book after much exertion and quizzical brow lifts from Clyde, I had not checked my email in two days. There was one from Gwen. Trust me, Gwen would not have lost the book. It begs the question: Is it too late for me to seek a new career or should I pack it in? A Book Review of Sorts. Ms. Cooper who BTW, wrote a lovely blurb for my Black Cats Tell All book, managed to pull off her new book in all versions including audio. Not only a new book but a pre-order for a Christmas book that looks too adorable and a masterfully choreographed marketing plan. The book is a #1 new release and drops October 30. It should do very well and appeal to both long time fans or new ones. For fans of Homer The Blind Cat, these two new books represent a milestone. The writing world can be fickle. It’s been ten years since Homer’s Odyssey fame and a testament to Gwen’s ability to sustain and grow her loving community. She’s an inspiration and I bow to her. I will say from what I’ve read so far, it’s ideal for holiday gift giving. The holiday season which has already started is going to be as fast-paced and hectic as ever. That means short attention spans and the ideal antidote are short stories. Sweet or savory chunks of feline goodness, these 8 stories satisfy one purrfect slice at a time. Clyde claims he did not abscond with my copy but can you really trust cats? Best of all, Gwen is donating 100% of her royalties on all pre-orders and first-week gross sales (via November 4th) to Blind Cat Rescue and Sanctuary in Raleigh, NC. This link is to the Gwen Cooper website where you can learn more or purchase via a number of options. Like to win a copy? Perhaps even my own copy once I find it? Share this post and leave a comment. FTC disclaimer: We received a review copy for our honest review. There are no affiliate links or other compensation. Happy Internet Cat Day! I hope it becomes an annual thing. I don’t think there’s a tuxedo cat day so I tried to invent one on my Gotcha Day only to forget it the very next year. Happy Gotcha Day Odin. Such a sweet surprise reminiscing about dear Gris Gris, Merlin and lil bad boy Odin! Such wonderful sun lit warm special things. The ripping off of the layers also reveals the golden moments of joy. Warm, rich, soft gentle, joy. Concats to Gwen! She definitely knows how to function and market in today’s world along with being a fabulous writer and cat lady extraordinaire. So true. It can be painful to tear off veils but in the light of day the darkest shadows fade. 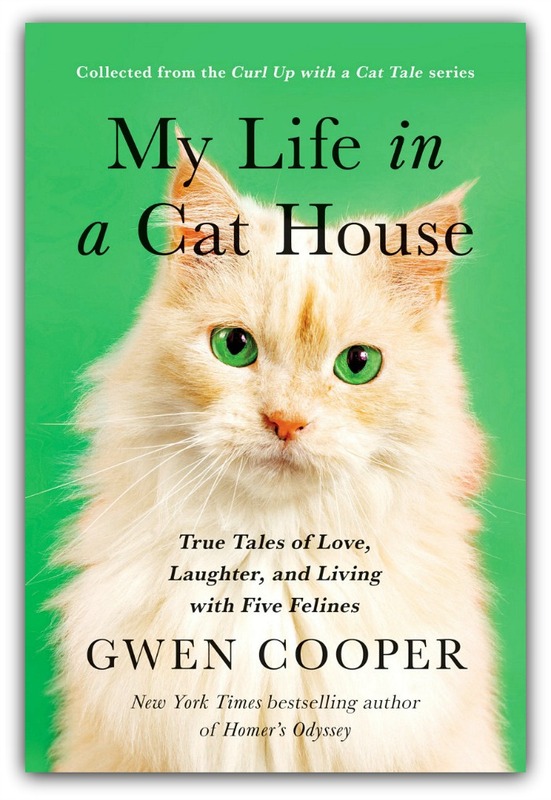 Yes, Gwen is a fabulous cat lady, writer and advocate. The Blind Cat Rescue is the ideal beneficiary. Loved hearing about Gris Gris and Merlin, I miss hearing from the old boy. Best of luck finding where Clyde hid your book! I don’t think Clyde could be bothered to steal your copy of Gwen Cooper’s new book….. But, having lived my life among cats, I’d bet sweet Clyde knows exactly where it is. After all, you can’t hide from Clyde! It’s good to see you back in my inbox regularly. I’ve missed your view of the world. Hi Dorothy, good to see you back! Subscriber notifications have been normal but I’ve blogged a little more often lately 🙂 The book is still missing and Clyde is not talking. My kitty, Habibti, and I had a nice lazy day on National Internet Cat Day. She napped while I read. Linda, that’s a great name for a cat and smart too! It’s sort of Internet Cat Day all year around here! NOW I understand what Ched was trying to tell me earlier. HAPPY INTERNATIONAL CAT DAY. He burbled, then shared his bounteous beauty of bodacious bod of orange and white fur, and a burble of a mew. He does not speak English, yet. Maybe next year. But he does a great job at Catlish. I loved your story about Gris Gris. Some are o watch and enjoy. What a lovely soul and of course Merlin…. PS trying to share, will look for ya on twitter and fb. Nah, not for a book for you. Everything Gwen does is “golden”….one day I MUST meet her! I would go all “fan girl” for sure. I am glad you and Merlin gave Gris Gris a happy ending. Gwen’s book looks great. Every day is Cat Day, International Cat Day, Internet Cat Day!